Take daylight™ with you, wherever you go! 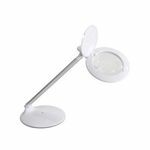 A collection of portable magnifiers with daylight™ LED’s that you can use in and around the house. Enjoy reading packaging, menus, medicine bottles and other details in comfort.